Nestled amongst the swaying palms and tropical gardens of Malolo LaiLai Island, Lomani Island Resort fronts a sprawling white sand beach and sheltered blue lagoon. Built in a contemporary style, the resort offers 12 beautifully appointed suites surrounded by vibrant landscaped gardens. No children under the age of 16 are allowed. 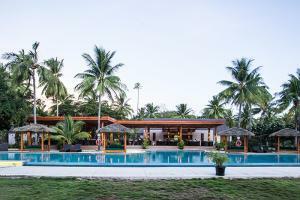 The resort is located in the Mamanuca group on Malolo Lailai. It fronts a sprawling white sand beach and sheltered blue lagoon. The island is 10 miles west of the Nadi airport, taking 50 minutes via catamaran from the Denarau pier. Surfing Safari, Dolphin Safari, Moonlight Cruise, Sunset Cruise, Island Hopping, Shell Village Trip, Art Gallery, Arts and Crafts Center.